Synopsis: A young farmer gets recruited by an old Jedi along with two droids and a smuggler in a mission to stop the evil Galactic Empire from bringing death and destruction in the galaxy, and to rescue Princess Leia from the clutches of the evil Darth Vader. Review: If ever there was a debate on films that have left their marks on the film industry, and indeed the entertainment industry in general, you would be hard pressed to find a film that has had the extensive impact that a film that was released in 1977 did. This film is of course Star Wars, and its impact is almost immeasurable. From the revolutionary effects, to the wondrous score, to the exciting story and instantaneously memorable characters, not to mention knocking Spielberg’s Jaws out in terms of the box office. This film had everything a film fan could want, and it is easy to see why it is still loved by legions of fans across the world, and remains insanely popular, nearly forty years after it was first unleashed on the world. Immediately, right from the off, the sheer scale of this universe is just mind blowing. With every hint of dialogue, the universe is grown and becomes more and more expansive. The iconic “In a galaxy far far away…” is fully realised as it is made to feel that this is a world in which you can go and visit, but ultimately you can’t (sob.) With the incredible world set up, we need our characters, and back when Lucas could write compelling and exciting characters and not have some whiny kid moaning about how much he hates something. Although having said that our main hero, Luke does have this attitude to begin with, but through some tragic circumstances, he is changed and grows as a character. Before long we meet a character who many (for good reason) see as one of the finest characters put to screen, Han Solo. A smuggler by trade, cocky, but awesome and a lot of fun to watch, and for the record, it has been said many times, but it’s worth saying again: Han DEFINITELY shot first! 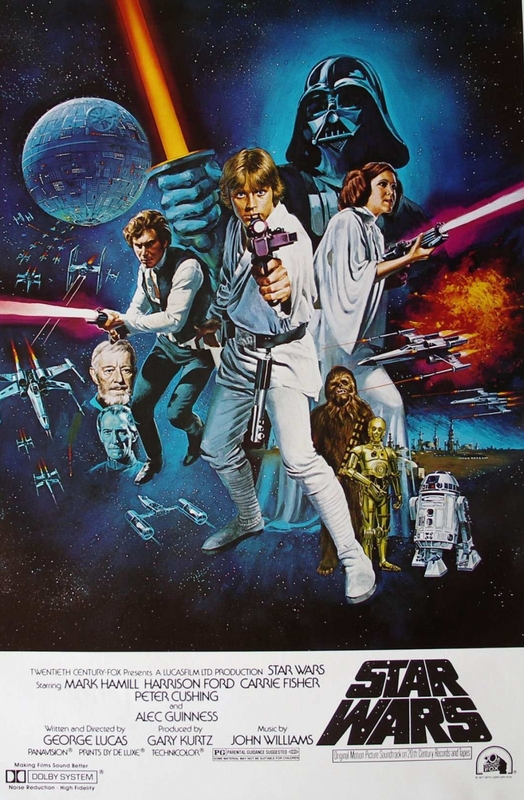 Of course, there are lots of other popular characters, the likes of Princess Leia, Obi Wan Kenobi, Chewbacca, R2D2, C3PO, and all are played brilliantly by their respective actors in what is one of the greatest ensemble casts ever assembled. The connection between the audience and these characters is very strong, much like the force! Of course with all the good characters, there are the villains. We have a character many consider to be one of the greatest and most iconic villains the world of film has ever seen, Darth Vader. Ruthless, menacing and very frightening, with the booming voice of James Earl Jones. However initially he is not top of the tree of the Dark Side, that honour belongs to Grand Moff Tarkin, brilliantly played by the late Peter Cushing, the man keeps Vader in check, preventing him from force choking everyone. All the while, the Empire is making their mark with the colossal Death Star they have constructed, that has the ability to devastate planets with just one shot, and the Rebel Alliance and their attempts to destroy this space station of terror. The film boasts plenty of memorable scenes and lines, from “that’s no moon! It’s a space station!” to “These aren’t the droids you’re looking for” to “I find your lack of faith disturbing!” With these great lines of dialogue, there are more than a few great scenes: Han VS Greedo, The Mos Eisley Cantina scene, Vader VS Obi Wan, and the final Rebel Assault on the Death Star to name but a few. Iconic and brilliant film-making all round, with effects that still hold up today and will do for a very very long time to come. What is also iconic is John Williams’ score, so recognisable and so loved by all. Like all great scores, it adds so much to the events on screen, giving certain events so much more impact and make them that more memorable and iconic in equal measure. For sure, since its release, there has been much tampering with the original theatrical release, and a lot of those changes have irked fans. For good reasons, there are some changes that just don’t make much sense, namely the Han VS Greedo scene, and the addition of a bunch of unnecessary CGI creatures that just add nothing to the plot. Yet for all of the unnecessary changes, the core elements of the film remain unchanged, and the film remains one of the most iconic pieces of film making ever. Even more so considering the problems that were experienced in the production of the film, with many wondering if all of the efforts were even going to come to fruition. They did, and in terrific style. Star Wars remains timeless, and it will probably remain so for decades and decades to come, even more so with the planned trilogy and spin off films that audiences have got coming their way over the next decade. A classic in every sense of the word, great characters, exciting story, terrific action and an iconic score will ensure this film will never escape the galaxy that is popular culture.